LaLatty Stamp 'N Stuff: We Have a Winner!!! 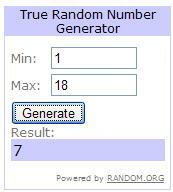 And to start off the week I have a winner for my card giveaway that I posted last Monday. I used random.org to randomly draw a winner and the winner was comment #7. Kari Congratulations to you, Kari and thanks so much for playing along. I will send you an email for your address and I'll have your cards in the mail this week, I hope you like them! Thank you to everyone else for playing along and be sure to check back again for my next giveaway! Now I'm off to create some cards while the baby is still sleeping.